She overcame an abusive relationship and emotional eating through structured exercise and plans and has turned her life around. Growing up, I was always on the thin side, but that changed halfway through high school. I was in an emotionally and physically abusive relationship with a boyfriend for three years. In order to cope with my feelings, I turned to food. Any emotion I felt, I ate. I ate until I thought I was happy. This went on for years, until I finally found the strength in myself to say this was it, I wasn’t going to be treated this way anymore. I was able to leave him to try and focus more on myself. I joined Weight Watchers, lost some weight, and was finally actually happy. I met and began dating my now husband. We did the normal things couples do, and we did them often — dinner, ice cream, drinks. I quickly put on any weight I had lost and gained even more. I was falling back into the bad habit of eating my feelings. Finding out I was pregnant with my son and having the doctor tell me, “You really can’t afford to put on weight, you’re already considered obese,” really hurt. Did I change? Not really. I still continued to eat the same way, and it not only caused extremely high blood pressure during my pregnancy, but it also required close monitoring by my obstetrician. Despite this, I delivered a happy and healthy baby boy. Years passed and I still fought that terrible fight of emotional eating, only now I was also experiencing anxiety. Now, not only would I eat my feelings, I’d then get anxious thinking about what would happen if I was always this way. What if nobody loved me for who I was? What if I had a heart attack? Who was going to care for my son? What would happen to my family? After many ER and doctor visits, one of the doctors suggested exercise. I tried some at home and I did that for about a year and a half. I saw great results and I loved it. Then I got stuck. I became frustrated and just wanted to give up, but instead I decided to go way out of my comfort zone and join a gym. I remember just doing the treadmill a few days in a row and wondering what people were thinking of me. I had to keep reminding myself that everyone was there for the same reason. I kind of worked my way around the gym, just sticking to the areas that were less busy. I came across Steve Flintoff on Instagram and sent him a message asking what protein powder he recommended. His response was, “I only recommend Pro JYM,” and that was the start of something real. One question after another, conversation after conversation; with Steve's help, I finally found what I had been looking for for so long: guidance, inspiration, and a mentor. I can’t thank him enough for everything he has done for me. 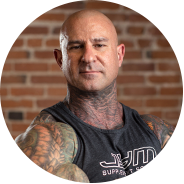 I added Pre JYM and Post JYM to the Pro JYM, and after a few weeks of hitting the gym every day and being involved on the JYM Army Facebook page, I decided to join JimStoppani.com. I picked the Beginner to Advanced workout program, started following Dieting 101, and I am currently a little more than halfway through. I couldn’t be happier with the results! I’ve lost 77 pounds in two years, and in the last eight weeks I’ve gone down two pant sizes. At 36 years old, I look forward to not only finishing this program but starting my next one. I couldn’t encourage you more to get involved with the JYM Army Facebook page, even before you start any supplements or programs. Ask questions — they are ALL there to help. I have made some of the best friends through this group. Shout out to Bill Janke: You’re truly an inspiration! Thank you for sharing your story, your knowledge, your advice, and for just being the best version of you. You have helped me more than you possibly know and I can’t thank you enough. Anthony Touart and Justin Kamb: Thank you for always being there to answer any question I have and for being here for me on this journey. Thank you to my husband, my son, and the rest of my family and friends who have supported me through this wonderful journey.